Stone Brewing Craft Bier Berlin. Nearly seven years in the making, American craft beer has made a milestone leap into Europe’s time-honored beer culture this week. Escondido-based Stone Brewing announced that its Berlin, Germany brewery now is fully operational and the company is distributing its brew to 17 countries throughout Europe. Stone is the first U.S. craft brewery to independently build, own and operate a brewery in Europe. For generations America was considered the laughing stock of the world when it came to beer, and while that old image is now decades out of touch, the former low opinion of American beer still survives in Europe, according to Greg Koch, Stone CEO & co-founder. “Stone is proud to be able to demonstrate to Europeans that American craft beer is now a proud and mighty part of our culture in the U.S., which is light years beyond the industrialized beer that Americans were subjected to for so very long,” Koch said. Thomas Tyrell, a 25-year veteran of the international beer community at the helm of Stone’s Berlin brewery. As Director of Brewing Operations, Tyrell manages all aspects of the production department, including brewing and packaging operations, production scheduling, incoming ingredients and materials, utilities, maintenance and, most importantly, beer quality. Tyrell is celebrated for his research on yeast strains, fermentation and beer flavor stability, according to Stone officials. Before joining StoneBerlin, he most recently spent eight years as an instructor and brewing engineer at VLB Berlin, where he led research and development projects and served as a technological consultant for breweries big and small across the world. The stunningly beautiful Stone Brewing World Bistro & Gardens – Berlin will open this summer and is expected to become one of the most photographed restaurants in Europe, Stone officials said. Housed in an expansive 1901 historic gasworks building, two bars will welcome fans to Germany’s largest draft selection with 65 beers on tap, featuring Stone and a wide array of guest craft and artisanal ales and lagers. The bistro will follow Stone’s food philosophy, focusing on small-farm organic produce and advocating for environmental responsibility and the Slow Food movement. Distribution: Austria, Denmark, Estonia, Finland, France, Germany, Ireland, Italy, Latvia, Lithuania, the Netherlands, Norway, Spain, Sweden, Switzerland, Poland and the UK. 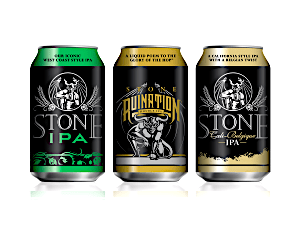 Select countries will also receive Stone Go To IPA in 0.33-liter cans and four-packs. As is the case in the U.S., all beers are refrigerated throughout the distribution process, and “canned on” and “enjoy by” dates are provided on the bottom of each can. Founded by Greg Koch and Steve Wagner in 1996, San Diego-based Stone Brewing is the 10th largest craft brewer in the United States. Stone has been listed on the Inc. 500 | 5000 Fastest Growing Private Companies list 11 times, and has been called the “All-time Top Brewery on Planet Earth” by BeerAdvocate magazine twice. The multifaceted company will be the first American craft brewer to independently build, own and operate their own brewery in Europe (Berlin, Germany), and is also building a production brewery and destination restaurant in Richmond, Virginia. Known for its bold, flavorful and largely hop-centric beers, Stone has earned a reputation for brewing outstanding, unique beers while maintaining an unwavering commitment to sustainability, business ethics, philanthropy and the art of brewing. For more information on Stone Brewing, please visit stonebrewing.com or the company’s social media sites: Facebook, Google+, Instagram, Pinterest, Twitter and The Stone Blog. Be the first to comment on "Stone Brewing builds Berlin beer buzz"